I wrote this on 4-10-2015. I needed a few days to pass before I could post it. I remember doing that in the beginning when I was writing about my Mom’s death. I needed for my blog readers & friends to know that I was fine and taking time between writing and posting made me feel like I was ok. That I was doing better. So, in true Kylee-style, I wrote this, I waited and I am fine. I am ok. I am doing better than what I was a few nights ago. But, in full disclosure, I own all of this. I’ve avoided any books with tragedy in them. I don’t watch movies where I know characters die. I turn the channel if someone loses someone. Or I look away. Or I get up and “remember” something that I needed to do. The loss of her, of my Mom, is still 1 year and 7 months later — bubbling under the surface. For some ridiculous reason I decided to watch the movie based on a true story, Wild. The movie about the woman who walked 1,000 miles through the Pacific Coast Trail after her Mom died; so she could find herself. In the movie there are constant flashbacks; her Mom just appears. I don’t think I was ready to watch it. I know what ashes look like. I know what it’s like to be handed a cardboard box of what is left of your Mom. And that’s when the tears started… and they haven’s stopped. If I allow myself here, I am overcome. So I cry because my Mom is ashes. I cry because she’s gone. I cry because she doesn’t have a gravestone. I cry because I miss her. I cry because her ashes are scattered on her land and in her garden; a garden that someone else now owns. 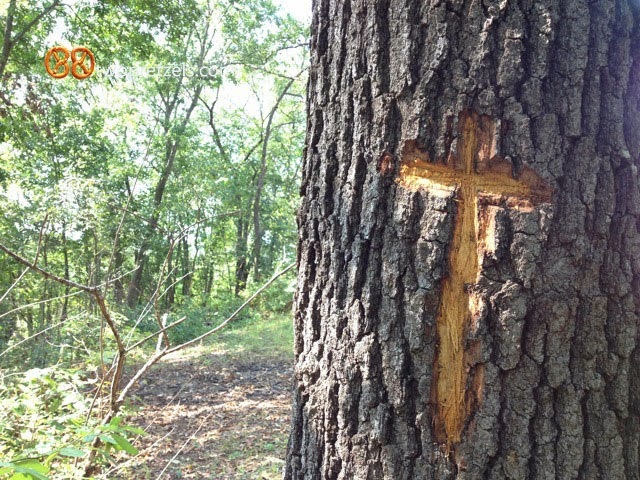 I cry because the trees that Craig carved the crosses in I will never see again. I will never touch them. I cry because she’s dead. I cry because I can’t see her again. I haven’t cried the heavy tears in a while. In all honesty, it had started to worry me a bit that I hadn’t really cried. What’s going on? And then now… the tears flow. Grief is always there. It’s a part of who I am now. I’ve said before that my life was distinctly divided in half: there’s before September 9, 2013 and there’s after September 9, 2013. I am simply “Kylee Before” and “Kylee After.” There is no part of my life that hasn’t been affected by my Mom’s death. And now, I’m just different. I want her to walk into my kitchen. I want to turn on a light and she be standing and smiling at me at the end of the hallway. I want to grab something out of the fridge and she hands it to me. I want to clean up after her in the kitchen. I want to curl the back of her hair that she can’t reach. I want to play skipbo with her. I want to fold her towels. I want to sit in the car next to her. I want to hear her dote on my babies. I want to eat a meal with her. I want to lay next to her in bed and read my book while she reads hers. I want to call her, I want her to answer, and I want to talk to her. I want things to go back to how they were, just for a moment…so that I can remember what it feels like to be Shirley’s daughter. I want to hug her and hold her. I want one more chance. We all want this. We all want one more chance. I am no different or no more special than anyone else. So this is right about the time in the program that I tell myself gently, “Enough…” and I remind myself that there’s got to be good that will come from this; there’s got to be something good. There’s something good, right? RIGHT? This is the time in the program that I remind myself that beauty will come from these ashes… from her ashes. « Oh, Martha. The life only *one* person was meant to live. Beautiful. Just want to hug you right now. I would take that hug and hug you back. Kylee, this post. This post hit me nearly as hard as the first one you wrote detailing the loss of Shirl. I actually read it and had to come back later because it keeps making me emotional.Those moments. I often think of my two grandpa's, who I was so close too, if I could just have a couple more moments. IF I could hug them, listen to the coins jingling in my grandpas pants as he messes with them, here my grandpa tell one more of his goofy and hilarious jokes, to see their faces/smiles. Though, even after 16 years since my grandpa pass, I still see his face so clear. it is weird. Or to to hug my friend again and see him with his girls.But not only did your post make me think of those who have passed, but just HOW precious THIS life is. To make sure that you take in THOSE moments. Treasure them. Hold them near. Always give one last hug and one last I Love You. Oh Kylee. This post. So beautiful and so real and so true and so emotional. I think we all have those times when we want those one more moments with the ones we love. HUGS HUGS HUGS to you. I love you too, my friend. I always feel your support. Grief is such a fluid thing, isn't it? I've felt the same… almost wrong… that I haven't really cried in awhile. And then bam… it hits again. Your posts always make me cry, but in a good way. You're so right. Grief IS fluid; it ebbs and flows. Whenever I read your posts about Jaime… Oh man… those videos… her voice.HUG.